We carry an extensive range of eyelash extensions to suit your desired look, eye shape and the condition of your natural lashes. Only the finest quality and latest products sourced from all over the world are used at our salon. We utilise synthetic mink lashes that look and feel real (without the animal cruelty), and specialist adhesive that is safe with minimal fumes. All new sets include a consultation, lash clean, moisturising under eye treatment, and a lash brush. ALL NEW CLIENTS: A $50 booking fee/deposit is required to secure your booking. This deposit amount will go towards your chosen service. Please note the deposit is NON REFUNDABLE if you do not show up to an appointment or cancel/reschedule within 24 hours. An appointment is only confirmed once the deposit has been paid - until the deposit is received, we reserve the right to give the requested slot to someone else. Complete the look with bottom lashes and ditch the mascara for good! Can be added to any set or infill, or booked on its own. 2-4 lashes are attached onto 1 natural lash for a natural but full and fluffy look. 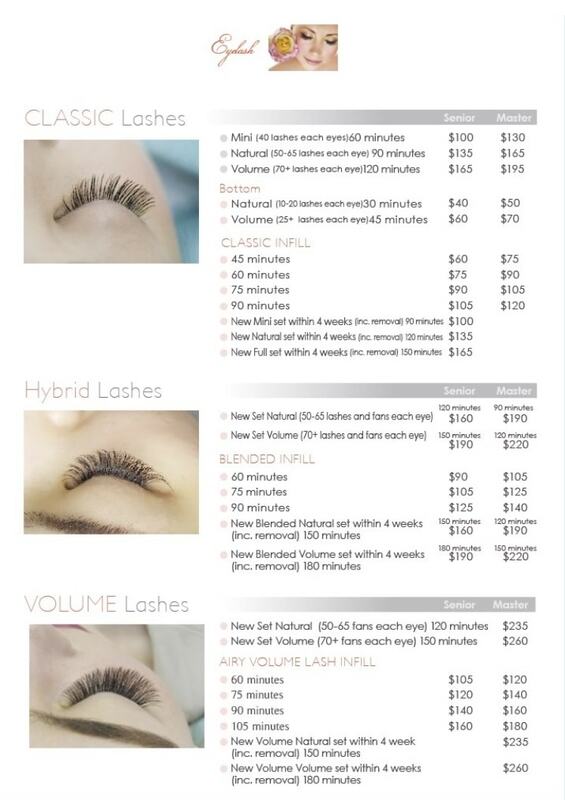 The number of lashes attached per natural lash will be determined by what your natural lashes can handle. *To keep our work consistent, we offer infills for existing Tokyo Lashes clients only. If you have lashes from another salon, a full removal will be required. All infills need to be applied within 4 weeks, otherwise a full set will be required. We offer infills by time. The longer the infill appointment, the more lashes we can apply on you. This new age lash perm lifts your natural lashes from the roots, giving the appearing of longer lashes and instantly opening up your eyes. The lash lift treatment is ideal if you naturally have moderately thick and strong lashes, have straight or downward pointing lashes, dislike using eyelash curlers or the lashes that don't stay curled, find eyelash extensions too high maintenance or find that they never last well on you, or wish to continue using eye makeup including mascara and oil based skincare. The effect lasts for the cycle of your natural lashes - up to 6 weeks. Confused which set is right for you? Please refer to our FAQ page.